The ASUS GTX 1050 Ti is one of the most powerful GTX 1050 cards out there. It offers high clock speeds, AURA lighting and semi-fanless cooling! 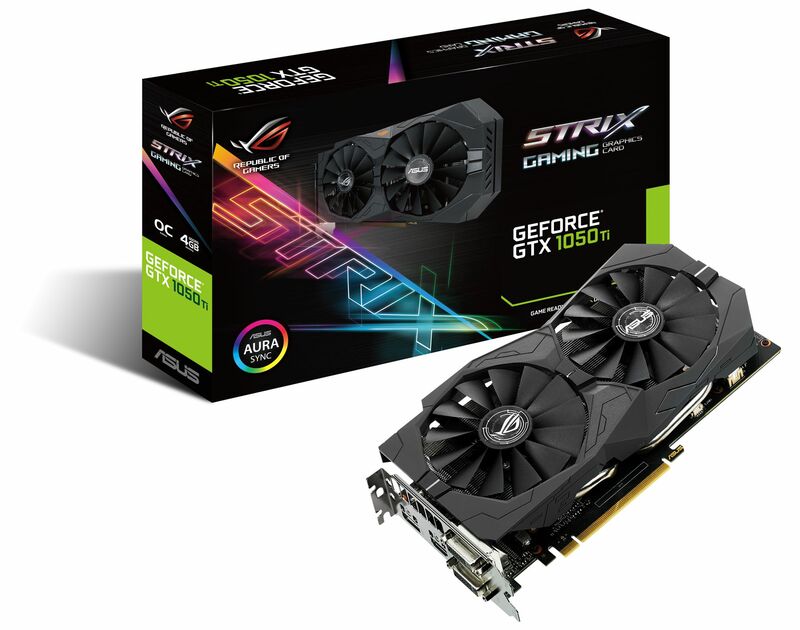 ROG Strix GeForce GTX 1050 Ti gaming graphics cards are packed with exclusive ASUS technologies, including DirectCU II Technology with Patented Wing-Blade Fans for up to 30% cooler and 3X quieter performance, and Industry-only Auto-Extreme Technology for premium quality and the best reliability. Aura RGB Lighting enables a gaming system personalisation. 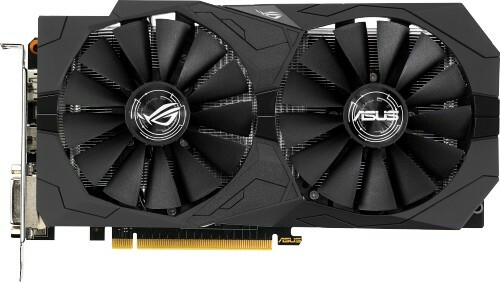 ROG Strix GeForce GTX 1050 Ti also has GPU Tweak II with XSplit Gamecaster that provides intuitive performance tweaking and instant gameplay streaming. Exclusive DirectCU II cooling technology features direct-GPU contact heatpipes that transports more heat away from the GPU and outperform reference designs, achieving up to 30% cooler gaming performance. DirectCU II features dual 0dB fans engineered with a patented wing-blade design that delivers maximum air flow and improved 105% static pressure over the heat sink, while operating at 3X quieter volumes than reference cards. The 0dB fans also let you enjoy games in complete silence and make DirectCU II the coolest and quietest graphics card in the market. When gaming, GPU temperatures are often higher than CPU temps. However, chassis fans usually reference CPU temperatures only, which results in inefficient cooling of the system. 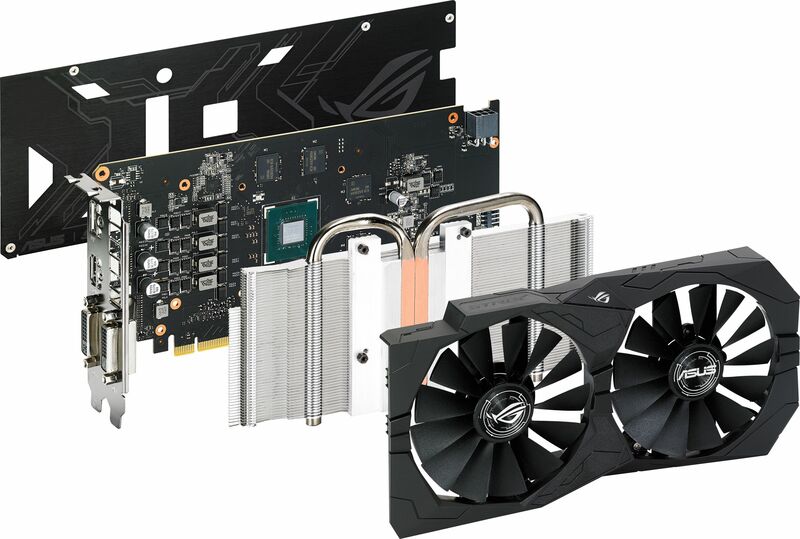 For optimal thermal performance, ROG Strix GeForce® GTX 1050 Ti graphics cards feature a 4-pin GPU-controlled header that can be connected to system fan for targeted supplemental cooling. Featuring Aura RGB Lighting on both the shroud, ROG Strix graphics cards are capable of displaying millions of colors and six different effects for a personalised gaming system. ROG Strix gaming graphics cards feature ASUS Aura Sync, RGB LED synchronisation technology that enables complete gaming system personalisation when the graphics card is paired with an Aura-enabled gaming motherboard. NVIDIA G-SYNC synchronises the ROG Swift gaming monitor's refresh rate to the GPU in your GeForce GTX-powered PC, eliminating screen tearing and minimising display stutter and input lag. With ROG Strix gaming graphics cards and ROG Swift gaming monitors, scenes appear instantly, objects look sharper, and gameplay is super smooth, giving you a stunning visual experience and a serious competitive edge.